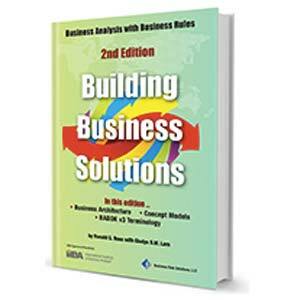 Summary: What does the business rule approach have to say about forming definitions of business concepts? What role should rules play in that regard? In this month's 'Premise and Conclusion' column, Ron Ross examines the notion of essence definitions -- business concepts carefully crafted so as to be extremely stable. Such definitions permit using rules to do what that are so good at -- handling the never-ending and often unpredictable succession of changes in related business practices. The central idea of the business rules approach is that any aspect of business guidance or know-how that might change should be treated as rules. In forming definitions, therefore, the practitioner should always focus what is unlikely to ever change -- that is, on the fundamental essence of business concepts. We call such statements essence definitions . For example, consider the definition of 'customer' proposed by a practitioner in a real-life project. That a customer may be either an organization or an individual person. That placing orders is the core criterion for being a customer. That a minimum of exactly one order is a criterion for being a customer. That an order having been paid is a criterion for being a customer. That the timeframe of exactly two years is a criterion for being a customer. Now consider the Webster's definition (2a) of 'customer'. The Webster's version is clearly better. The embedded business practices of the practitioner's version should be treated as forms of guidance, as follows. Rule: A customer always places at least one paid order during the previous two years. Clarification: A customer may be an organization or individual person. Is the Webster's definition exclusively 'essence'? Almost, but not quite. Note the word 'purchases' in the 2a definition. Having to purchase something to be a customer is a constraint. Many people (especially marketing!) would probably not want to place that constraint on being a 'customer'. This is about as close to pure essence as a definition for this concept could possibly become -- a very stable anchor point for encoding operational business knowledge.